*CAT® (Combat Application Tourniquet) by NAR - North American Rescue. *MATCombat™ Tourniquet by PYNG Medical. *SOF®TT (Special Operations Forces Tactical Tourniquet) & SOFTT-W (Wide) by Tactical Medical Solutions. *RMT™ (Ratcheting Medical Tourniquet) - variations: Tactical, 2”, K9, Pediactric, Paramedic, & Rescue. But before we dive into Tourniquet technologies, lets review the induction of the Tourniquet into Combat related Casualty Care. Tourniquets, rarely used in the civilian sector, have become a standard part of every soldier/Marines equipment. All medics/Corpsman/PJ's and SOF personnel have been trained in their use. In the past, tourniquets were avoided due to concerns regarding their misuse leading to limb ischemia and lack of adequate hemorrhage control. However, this scenario typically was associated with makeshift tourniquets, such as a bandage and a stick, which were often improperly applied. Newly designed tourniquets combined with improved widespread training on tourniquet use have played a major role in improving hemorrhage control following combat injury. This is especially true in battlefield or other austere environments, when access to definitive care may be delayed. At the start of OEF and OIF, there was very little tourniquet use. However, tourniquets are now applied following nearly every severe extremity injury. 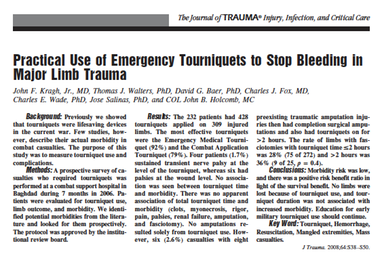 A 2008 study of severe extremity injury in an OIF Combat Support Hospital deemed that tourniquets are effective in controlling hemorrhage with no increased incidence of significant limb ischemia or early adverse outcomes. Kragh et al. 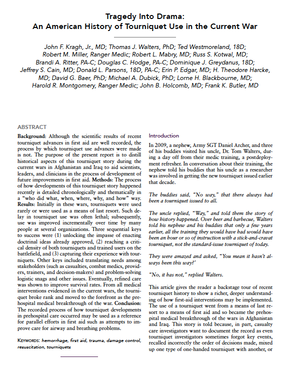 conducted the first prospective study of 2,838 casualties with major limb trauma admitted to a Level III Combat Support Hospital in Baghdad, and demonstrated survival benefit associated with tourniquet use. Improved survival was also associated with placement of tourniquets prior to the onset of clinical signs of shock. Of the 232 patients who received 428 tourniquets (applied to 309 injured limbs), transient nerve palsy was the only adverse outcome attributed to their use. If removed within six hours of application, tourniquets save lives without causing limb damage or secondary amputation. The conclusion of this survey showed morbidity risk was low, and there was a positive risk benefit ratio in light of the survival benefit. No limbs were lost because of tourniquet use, and tourniquet duration was not associated with increased morbidity. Click Here to view the Entire survey of "Practical Use of Emergency Tourniquets to Stop Bleeding in Major Limb Trauma”, by Kragh et al., Journal of TRAUMA. So now that we know the efficacy of Tourniquets and that we have choices of tourniquet types, what exactly does a tourniquet do, and how does it do it? Definition: A tourniquet is a constricting or compressing device, specifically a bandage/strap, used to control venous and/or arterial circulation to an extremity for a period of time. Pressure is applied circumferentially upon the skin and underlying tissues of a limb; this pressure is transferred to the walls of vessels, causing them to become temporarily occluded. It is generally used as an emergent tool for medical professionals in applications such as stemming the flow of traumatic bleeding, especially by military medics/Corpsman. The tourniquet is usually applied when the patient is in a life-threatening state as a result of continuous and uncontrollable bleeding. There are other variations and applications of tourniquet use such as the ERT or S-MART type tourniquets, but these are primarily utilized in the Orhtopedic Surgical Realm. Anesthesiologists and CRNA’s also utilize a tourniquet system for IVRA (Intravenous regional Anesthia), also known as, “Bier Block”. 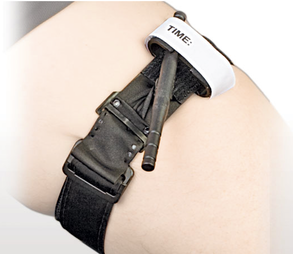 The big brother to the typical limb tourniquet is the JETT™ (Junctional Emergency Treatment Tool). This is a large tourniquet designed for bilateral or unilateral occlusion in the event of uncontrollable bleeding from both lower extremities. 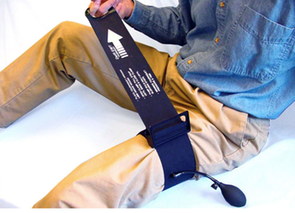 Managing bleeding from the thigh or groin areas can be extremely difficult, the JETT is designed to apply pressure directly to the Femoral arteries inferior to the Inguinal Ligament. 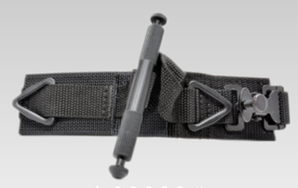 The smaller brother to the typical combat Tourniquet would be a RMT™ (Ratcheting Medical Tourniquet) by M2inc. This type of tourniquet is one of the smallest in design, lightweight, and extremely effective at hemorrhage control. 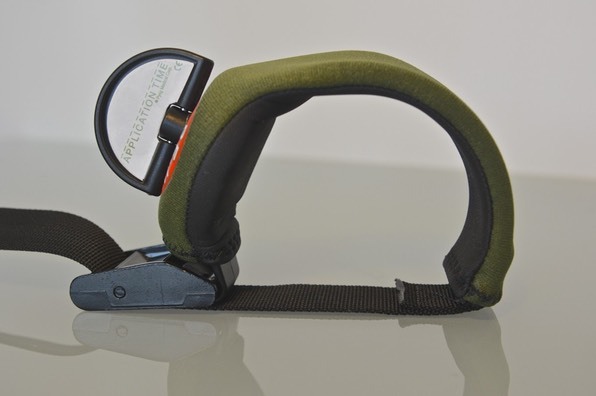 The RMT is unique in that it has the instructions printed directly on the tourniquet, and still applies circumferential pressure by way of a 1.5” wide strap. Probably one of the most efective and proven Tourniquets is the MAT® and MATCombat™ Tourniquet. In 2007 a report was released from the Naval Experimental Diving Unit which compared 13 different tourniquets and the MAT® ranked at the top. The results of this clinical study can be viewed HERE. Regardless of which Combat tourniquet you utilize in the field, it’s imperative to know the most “up-to-date" tourniquet protocols along with each individual manufacturers product guidelines. All tourniquets have the same objective, to stop hemorrhaging, but not all tourniquets are applied in the exact same manner. Know your gear. Below are just a few of the MANY tourniquets available on the market for the combat/tactical/military Medical Personnel. At the top of this page are links to the below listed products and their manufacturer websites. Another excellent white paper by KRAGH ET AL… “An American Hx of Tourniquet Use in the Current War”. JEMS (Journal of Emergency Medical Services) has a 2013 publishing of, “ The Facts & Details about Different Types of Tourniquets”. Click here to view article.